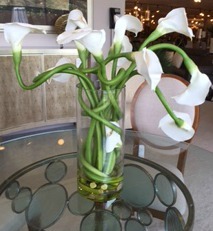 Many brides choose calla lilies for their centerpieces because they are beautiful elegant flowers and come in a wide assortment of colors to coordinate with your wedding pallet and make fabulous centerpieces. Lilies represent purity, grace and rebirth. They are widely used at functions in Europe and have become popular among American artists because they are stately and distinctive. Calla lilies are available year-round and typically last for five to six days once they are cut, making them a very hearty floral centerpiece. They are not terribly expensive (a large white calla lily is approximately $5) and can be arranged in a variety of ways to meet your budget. Please note that there are natural variations in the color of calla lilies and the hue of the flower sometimes deepens naturally as the blossom matures. Sometimes white lilies have pinkish or greenish edges. 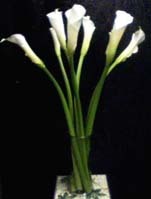 To keep the calla lilies fresh, snip a half inch from the stem before placing them in the vase. A simple arrangement can have three blossoms in a clear glass vase. If you would like your table decoration to be more elaborate, surround your flowers with your choice of greenery or bare branches that can be taken from your garden. Flower Express, located in Atlantic Highlands, NJ. created the above calla-lily centerpiece. The only significant difference in a premium or extra-tall calla lily is the length of the stem and the bloom on the extra-tall calla lily can be slightly larger. For tall upright vases, I recommend the extra-tall lily. 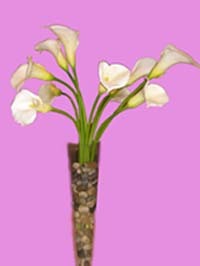 Calla lilies can be easily bent making them a very versatile flower. Place the lilies in a bowl filled with water and arrange the lilies in a circular manner. Don't forget to arrange the heads of the flowers face upwards or towards the out side of the bowl. 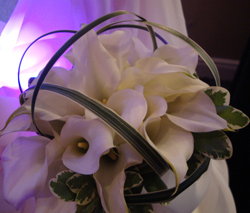 Intertwining lilies within a twig wreath creates a very stunning table arrangement. When making this kind of centerpiece, try to handle the flower as little as possible to avoid damaging the bloom. 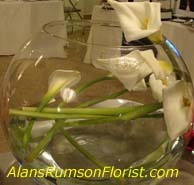 Another centerpiece idea is to place a single lily in a vase with pebbles around the base of the vase. If you would like your centerpiece to reflect your overall color scheme place colored marbles or glass in the base of the container. You can also use one single calla lily surrounded by several smaller colored calla lilies to add some additional color to the above ideas. And don't forget to have your wedding bouquet match your centerpieces. 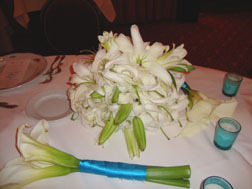 The bouquet below created by "Flowers by Addalia" has beautiful white calla lilies and some greenery. 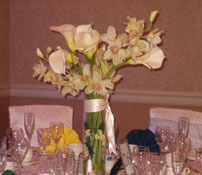 You can have your florist make a calla lily centerpiece to match this stunning bouquet. 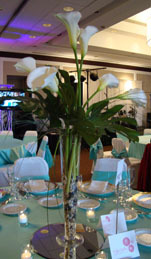 The calla lily centerpiece is elegant and can be as simple or lavish as your budget allows. Please check out my links below for other wedding ideas.